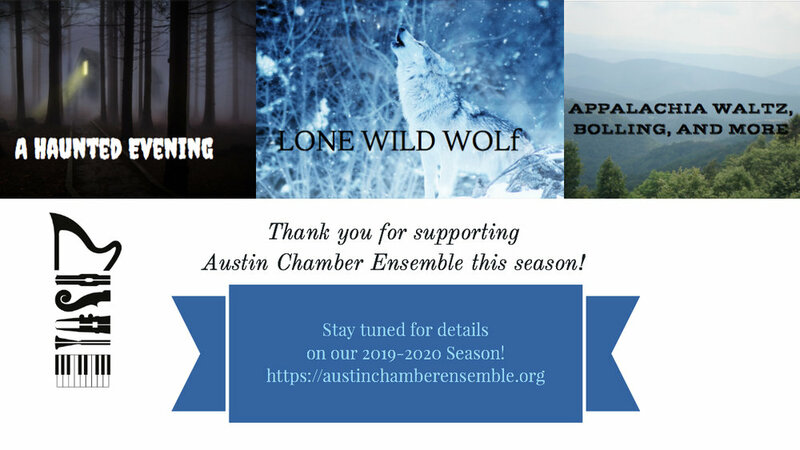 The Austin Chamber Ensemble announces its 38th Season! Favorite Austin area artists June Julian, Katherine Altobello, Jeffrey Jones-Ragona, Stephen Burnaman, and Martha Mortensen Ahern present an evening of music to ‘fit the season.’ Featured on the program will be vocal solos, duets, trios, and piano duets with works from Musical Theater (Wicked, Sweeney Todd), Opera (Lucia di Lammermoor, Un Ballo in Maschera, Aida) and more! Visit our ACE Videos page for preview videos and the ACE Artists page to learn about our artists. Pianist Patryce King presents a program titled Lone Wild Wolf to highlight the Full Moon of January 2019. Martha Mortensen Ahern will join Ms. King in performing the Poulenc Sonata for Four Hands. Expect to hear a mostly solo piano program featuring the wild side of Beethoven, Ginastera, and more. Visit our ACE Videos page for a preview video and the ACE Artists page to learn about our artists. Be sure to buy tickets for the Sunday performance early! Seating is limited at this private residence. We welcome the return of James Anderson, violin/fiddle to perform selections from Claude Bolling’s Suite for Violin and Jazz Piano along with a jazz trio (Martha Mortensen Ahern, piano; Phil Spencer, bass; and Brennan Howell, drums). Karla Hamelin, cellist, will also be joining the ensemble performing works by Mark O'Connor, Paul Schoenfeld and others. Visit our ACE Videos page for a preview video and the ACE Artists page to learn about our artists.